Service is not just an added product. It's the experience. Over the last couple of years, clean and fresh water has truly become the new gold in America. As the scarce water resources have hit the headlines in media, maintaining the sewer and drainage network all over the world continues to be a vital task in upholding the living standards we have grown accustomed to in modern day life. 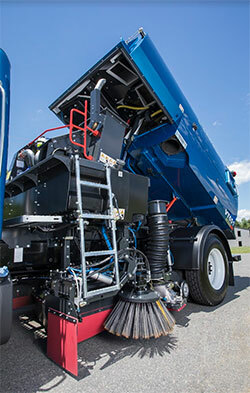 To stay on top of this, new technologies such as water recycling systems and fuel efficiency configurations have become pivotal parts of the sewer cleaning unit industry. It's not only about the products, however. The service and back-office support to our customers continues to be just as vital ingredients in delivering a great customer experience and tools for a safe and clean city. In 2018, we started building our Service Center in Ontario, California in order to offer our business partners the best customer experience in the industry. This Service Center, however, is the first of its kind in the United States, and it is not just a traditional Service Center – it is a Bucher Municipal Center of Excellence. "In May 2019, we further strengthen our operations in California by bringing opening our first Bucher Municipal Center of Excellence. The Center of Excellence offers our business partners a solid Customer Experience concept based on the experience of Bucher Industries – a 200 year old global technology group with a leading market position within cleaning and clearing equipment", says John Sullivan, Country Manager at Bucher Municipal, Sewer & Drainage. The Bucher Municipal Center of Excellence in Ontario, CA is not just the first of its kind in North America; it is a brand new concept to our North American business partners. "Where service outlets previously were seen as a location for sales and repairs, the Bucher Municipal Center of Excellence is a brand new concept: A full-service location with a range of upscale amenities ready to service all Bucher Municipal products. 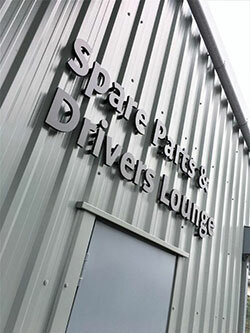 Here, we offer our business partners traditional service products, but also training, demonstration and showroom facilities as well as spare parts and accessories Shop-in-Shop. Just to mention a few", John Sullivan explains. On May 8th and 9th 2019, we would like to invite everyone from the industry to the Grand Opening and Educational Days at our Center of Excellence in Ontario, California. No matter if you work with cleaning and clearing operations on a municipal or state level, if you operate as a private contractor or operate one of the products from the cleaning and clearing industry, we'll be looking forward to welcoming you at 1551 S Vineyard Ave, Ontario, CA. At this event, we're proud to introduce – as one of the first in the market – a range of Electrical Winter & Sweeper Equipment in addition to our range of sewer cleaning units. In addition to that, we have added an educational element to the Grand Opening, as technology has become central in the operation of cleaning and clearing equipment. Here, we will offer complimentary training in maintaining equipment and preparing it for the various seasons of the year, making sure operations stay on track. Visit our website and download the program. There is no need to sign up for the event and it is completely up to you which day you would like to join us – or if you want to join us both days. We look forward to welcoming you! For more information about Bucher Municipal North America, contact Charlotte Holm Jensen, Marketing Coordinator, Sewer & Drainage, via email sent to marketing@hvidtved.com.